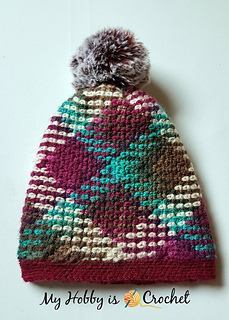 This argyle crochet hat was made to match the Argyle with a Twist Infinity Scarf. Because the moss stitch pattern is only stretchy in height, I chose to work the hat sideways in rows. That produced a very stretchy hat, that is very comfy to wear. The hat circumference is customizable to the size you need by working less or more rows.